A growing number of measles cases this winter has reignited the debate over vaccination. While the vast majority of Canadians believe in the merits of vaccination, and inoculate their children against a wide range of diseases, including measles, a significant number of Canadians refuse to vaccinate their children or do not complete the full vaccination schedule. Vaccine resistance in Canada has a history, as Michael Bliss, Kathryn Arnup and Paul Bator have shown. During a smallpox epidemic that killed more than three thousand in Montreal in 1885, the Health Board of Montreal compelled people to isolate the sick and vaccinate the well. Many working-class Montrealers felt that if the government really cared about their health they would do something about their living conditions, which they rightly believed were contributing to high rates of disease and suffering. The situation was further complicated by the fact that some of the people vaccinated early in the epidemic had developed severe ulcerations and fever. One child died. A crowd of a thousand, mostly men, broke the windows and damaged property at the East End Health Office, at City Hall, the Montreal Herald, the homes of health officials, and pharmacies that sold the vaccine. In Toronto, in 1900, an Anti-Vaccination League was formed to protest compulsory vaccination. In 1887, after the Montreal smallpox epidemic, the government of Ontario had passed legislation requiring that parents have their children vaccinated before they reached the age of four months, and re-vaccinated, if necessary, every seven years. The legislation permitted local school boards to require children to be vaccinated, and the Toronto Board of Education passed a by-law to this effect in 1894. The Anti-Vaccination League sprang into action and five thousand Torontonians signed a petition demanding the repeal of the by-law. Anti-vaccinators noted that there were class divisions in how mandatory vaccination was being applied, objected to the side-effects of vaccination, and did not believe that people should have to vaccinate against their will. Opposition to vaccination quieted in the middle decades of the twentieth century, partly because a growing number of vaccines made serious inroads against childhood diseases. Diphtheria toxoid, first introduced in Toronto in 1926, reduced deaths from this frightening disease that killed children through suffocation from over 1200 in 1924 to less than a hundred deaths/year by the late 1940s. The death and suffering caused by polio dramatically decreased after the Salk vaccine made it to market in 1955. 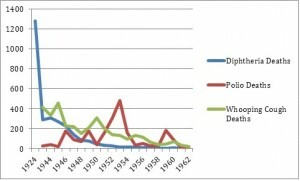 Deaths from whooping cough (also known pertussis) began to decline after the introduction of the vaccine in 1936-7 and its increasing use once it was combined into the DPT (diphtheria, pertussis and tetanus) vaccine in 1947. In the thirty years from 1920 to 1950, death rates from communicable diseases in Canada decreased by a tenfold. Memory and lived experience showed parents that childhood was much safer for children in the 1940s and 1950s than it had been for them, or for their own parents. At the same time, public health departments in cities and provinces across the country made vaccines readily available to parents, and educated them on why they should use them. The Health League of Canada, the focus of my own research, launched a National Immunization Week in 1943 that lasted until 1971. 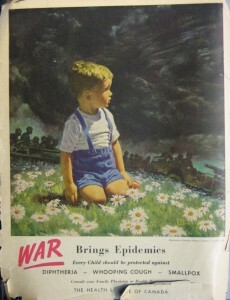 For a week, Canadians viewed short advertisements before movies promoting immunization, they saw advertisements in their local newspaper, they read editorials promoting immunization in prominent magazines like Chatelaine and they heard spot announcements on radio and television. Family allowance cheques featured messages promoting immunization, and doctors’ offices, pharmacies, and life insurance companies put up posters. The advertising used guilt and fear to encourage parents to get their children immunized – one oft-repeated advertisement had the tag-line “’Yes…you have a very sick baby’ And That Baby SHOULD HAVE BEEN PROTECTED BY IMMUNIZATION.” At the same time, the campaign tried to convince parents that having their children immunized (and listening to the expert advice of doctors) was a crucial aspect of citizenship. The Health League and government agencies never promoted compulsory vaccination (although compulsory smallpox vaccination remained in place): instead, they believed in educating parents. Indeed, it was not until the early 1980s that provinces such as Ontario and New Brunswick passed legislation that required schoolchildren to be vaccinated. Today, Canadians are much more cynical about “experts,” less motivated by the duties of citizenship (as declining voter participation rates show), and less fearful of childhood diseases than they were in the 1950s. The media landscape has shifted: parents are no longer consistently exposed to positive messages about immunization. Instead, a quick google search will turn up all sorts of alarming information about vaccines. All this has contributed to vaccine resistance. Some people fear that doctors and “big pharma” are colluding to hide the dangers of vaccination, some believe that the measles, the current cause of debate, rarely causes serious harm, and some feel that they are the best guardians of their children’s health. The history of compulsory vaccination shows that this is unlikely to be solution. Instead, we need to work harder at convincing Canadians of the merits of vaccination through a renewed media effort. Dr. Catherine Carstairs is an Associate Professor in the History Department at the University of Guelph. She is the author of Jailed for Possession: Illegal Drug Use, Regulation and Power in Canada, 1920-1961. Katherine Arnup, “‘Victims of Vaccination?’: Opposition to Compulsory Immunization in Ontario, 1900-90,” Canadian Bulletin of Medical History 9 (1992), 159-76. Paul Adolphus Bator, “The Health Reformers versus the Common Canadian: The Controversy over Compulsory Vaccination Against Smallpox in Toronto and Ontario, 1900-1920,” Ontario History 75, 4 (1983), 348-73. There is a exhibit at the Museum of Health Care in Kingston, Ontario that I guest curated titled: “Vaccines and Immunization: Epidemics, Preventions and Canadian Innovation”, which opened in November 2013. I’m a professional medical historian specializing in infectious diseases, public health and biotechnology in Canada.